Saint Ignatius and Loyola graduate Tom O'Hara set a world record for the indoor mile with a 3:56.4 at Chicago Stadium in 1964. O'Hara also participated in the 1964 Olympic Games in Tokyo. CHICAGO — The greatest miler in Chicago's history still loves to run. Even at age 74 — 52 years after setting a world record that stood for 10 years — Tom O'Hara relishes a 30-minute jog around his local park. "It's probably not even a 10-minute-mile pace anymore, but I'm not interested in that," said O'Hara, the former star at St. Ignatius College Prep and Loyola University Chicago. "I just still generally enjoy it. It's a real break for me." O'Hara's times have gone way, way down since the Bucktown native became the first Illinois runner to break the 4-minute barrier, clocking a 3:59.4 in 1963. He set the indoor mile world record at Chicago Stadium on March 4, 1964, with a 3:56.4 — a mark he held until 1974. Later in 1964, he made the U.S. Olympic team that competed in Tokyo, but he got the flu and didn't qualify for the 1,500-meter finals. "I was really disappointed because some of the competitors I know I could have beat," O'Hara said. "But that's just the way it is." Former Loyola and current University of Illinois-Chicago track coach James Knoedel said O'Hara's mile record at the time was "somewhat akin to the marks Jesse Owens set at Ohio State — unreachable." But Knoedel said O'Hara would never brag about his times. "Tom is a very quiet, unassuming person who had an inner drive that few people possess," Knoedel said. O'Hara said he didn't know where his determination came from, but it was always there. When he was in second grade, he would race his sister and friends about a mile from their home at Fullerton and Damen to St. Bonaventure School near Clybourn. He hated to lose. "If someone gives me a challenge, I try to beat them," O'Hara said. "That's the type I am." He might have gotten his drive from his father, Thomas, an operating engineer for the City of Chicago who also happened to get kicked out of Saint Ignatius his sophomore year. O'Hara said his dad refused to let the same thing happen to him. O'Hara still visits Saint Ignatius from time to time. 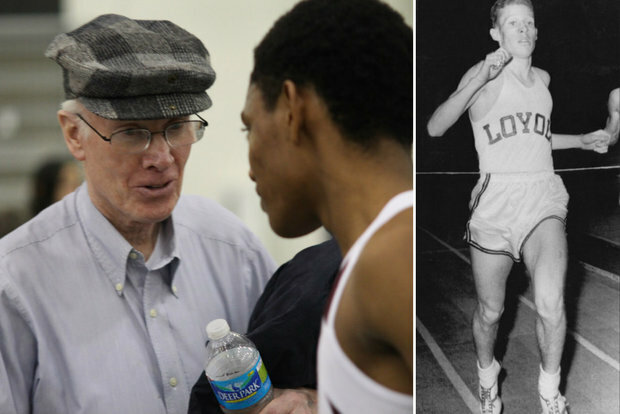 The track coach there, Ed Ernst, considers O'Hara "a forgotten hero from a forgotten time." O'Hara is just fine with that. Self-described as "shy and not the gregarious," O'Hara doesn't like talking about himself. As the years pass, fewer people bring up his records, and that's OK.
Loyola's senior associate athletics director, Tom Hitcho, described O'Hara as a devoted family man who never forgot where he came from." O'Hara has been married to Joan for 50 years, sold insurance to doctors for half a century and has lived in suburban Lombard for nearly as long. "I don't believe in moving around," O'Hara said. The sport used to be O'Hara's "whole life," he said. The training, the wins, the adulation from other runners, they "meant a lot to me," he said. Now, O'Hara said, he finds the same type of a joy in a quick run around a quiet park.